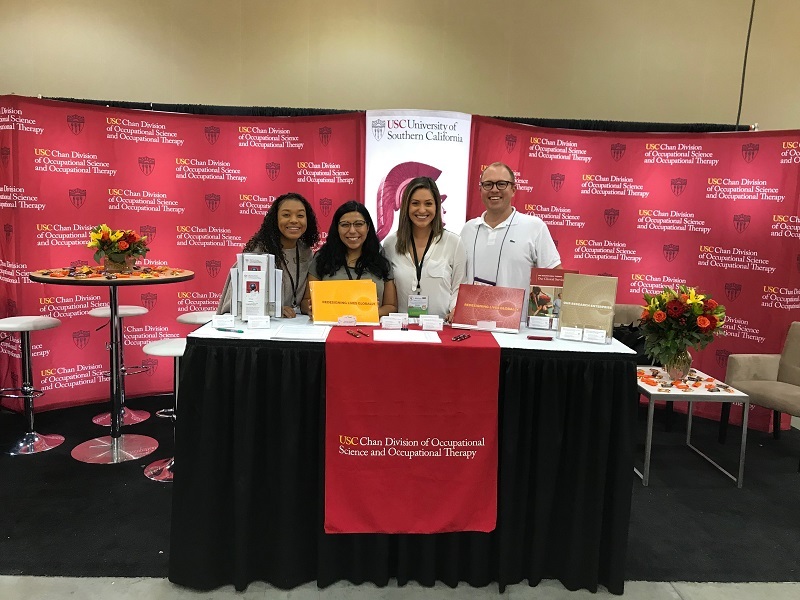 This past weekend the Student Ambassador team and I set up USC’s booth for the Occupational Therapy Association of California (OTAC) Annual Conference in Pasadena. 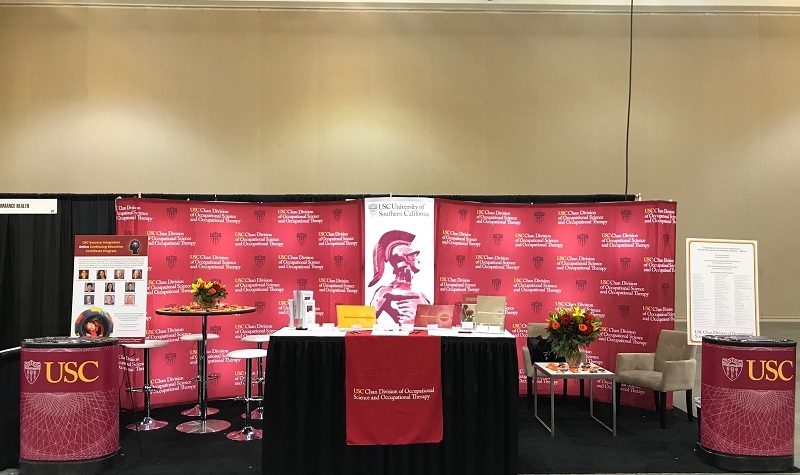 I wanted to share a few pictures of the booth that attracted so many occupational therapists and occupational therapy students interested in the many programs that we have to offer. In particular, there was much interest in the Doctorate of Occupational Therapy (OTD) program, Doctor of Philosophy in Occupational Science (PhD) program, and Lifestyle Redesign. However, there was an overwhelming interest in our USC stickers and Halloween candy! 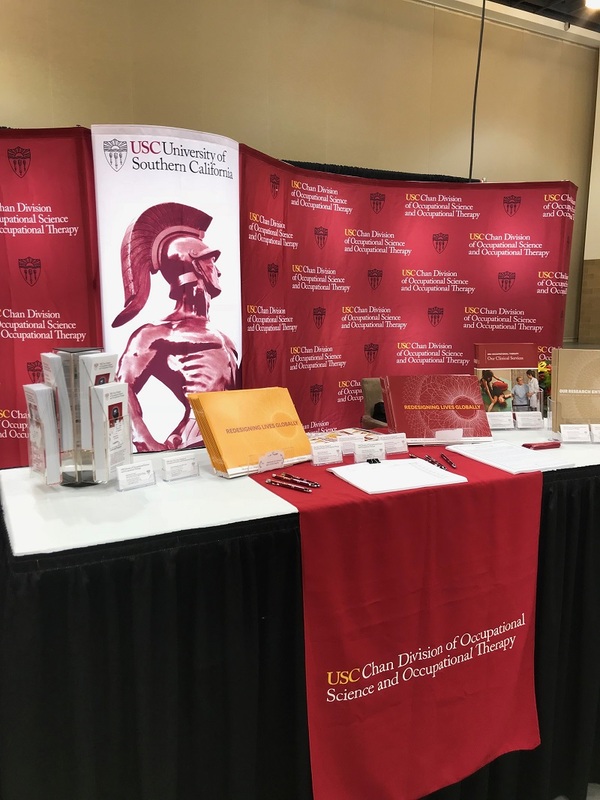 USC’s booth at the Occupational Therapy Association of California (OTAC) Conference. Brochures highlighting the various Occupational Therapy programs offered at USC. 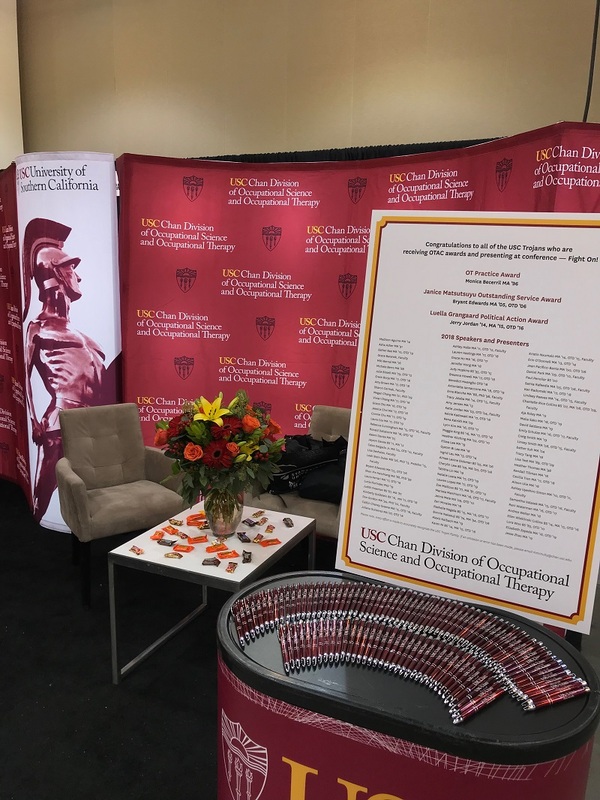 Poster board of the many USC Trojans receiving OTAC awards and presenting at the OTAC conference with the beautifully displayed USC Chan Division pens. 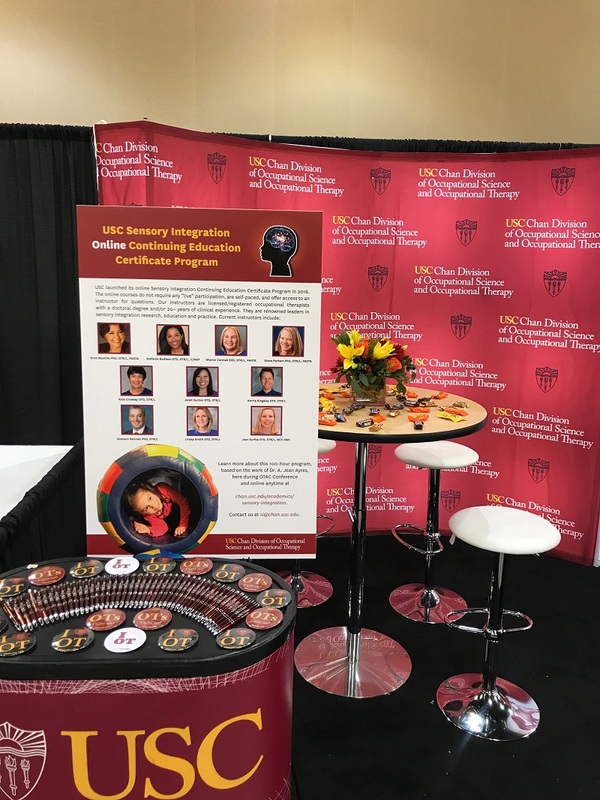 USC Sensory Integration Online Continuing Education Certificate Program poster board. Bianca, Melissa, Evan, and me at the USC booth after setting it up. 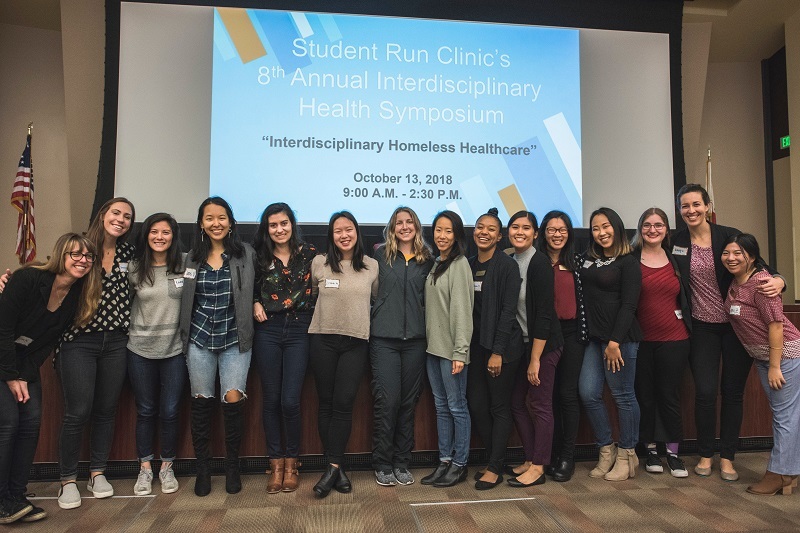 At USC Student Run Clinic’s (SRC) 8th Annual Interdisciplinary Health Symposium, students from Medicine, Physician Assistant (PA), Pharmacy, and Occupational Therapy (of course!) programs explored healthcare topics related to homelessness in Los Angeles. There were many honorable guest speakers doing fantastic work in their respective fields. One was a Physician Assistant and USC alumni, Brett Feldman. However, his documentary Close to Home: Street Medicine was nominated for an Emmy so he was unable to make it. 1) meet the patient where they are at or else we will experience burnout. 3) make sure our services come from the heart. As an OT student I was intrigued by this statement. OTs acknowledge how lifestyle changes when one becomes homeless. We focus on developing ways to address challenges that come with new daily activities such as changes in sleep and toileting routines. It was a huge eye opener that the area that she listed to be her number one challenge was a specific area that OTs address. Dr. Stephanie Moon, who is an occupational therapist at the Student Run Clinic advocated so passionately and eloquently about the many ways that OTs can help promote health in the homeless population. She proudly stated how OTs are the “Masters of Function”, how our secret sauce is activity analysis (looking at how difficult a task may be for a person), and the importance of addressing occupational deprivation (the loss of ability to participate in activities that are meaningful). Dr. Stephanie Moon stayed true to the creativity that OTs bring to the healthcare system by sharing a story on how she compiled recycled cardboard to create an elevated surface that would allow a patient who was homeless to experience better sleep quality. Attending the 8th Annual Interdisciplinary Health Symposium was a wonderful experience. I loved gaining different perspectives and learning about more ways to better advocate for the field of OT. At the 16th Annual Afternoon Tea with a Scholar, I received tips from self-care to ways to receive financial aid as a student and practicing OT. The event was very informative and a wonderful way to bring occupational therapists together. Previous student ambassadors have wrote about their experiences with past Tea with a Scholar events, which have featured Dr. Florence Clark and Dr. Ann McDonald. So you may ask, “What is Afternoon Tea with a Scholar?”. It is an annual event put on by occupational therapists. The intention is to bring the profession together to discuss current research in the field of Occupational Science. To set the scene a bit, there were students, faculty, and staff members from USC, Cal State Dominguez Hills (CSUDH), and Loma Linda University (LLU). Additionally, board members from occupational therapy organizations like the California Foundation of Occupational Therapy (CFOT) and the Occupational Therapy Association of California (OTAC) were present. So as you can probably tell it was a great way to get more connected with the larger OT community. My colleagues and me at the 16th Annual Afternoon Tea with a Scholar proudly holding the Trojan sign in front of USC’s Center for Occupation and Lifestyle Redesign. The event was held at USC’s historical Center for Occupation and Lifestyle Redesign. The topic of the afternoon was Community Health and Wellness. Dr. Julie Kugel was the honorable guest lecturer and is the director of the Occupational Therapy Doctorate (OTD) program at LLU. She presented on the current research she was engaged in and shared some of the impactful experiences that have shaped the scholar she is today. She addressed the concept of doubt and kindly stated that “Doubt does not make us any less, it makes us human,”. The ability to select so many different paths in the field of occupational therapy at times creates doubt, at least for me (lol). However, with this new understanding, I find doubt to now be humanizing and a common life experience. Another concept that Dr. Julie Kugel spoke about was what it means to be a true scholar. A true scholar is a person who is able to engage in conversation and advocate for our profession. I find this skill to be crucial in our ability to expand in areas where OTs are not currently practicing but are so desperately needed in helping to promote overall health. Additionally, the benefits of volunteering at conferences was also touched upon since this allows you to understand and learn about what goes on behind the scenes. Plus, you can possibly receive a conference ticket discount by volunteering a couple of hours of your time. While volunteering, you never know who you may meet and what those connections may lead to in the vast world of occupational therapy. Dr. Julie Kugel after her lecture on Community Health and Wellness. My relationship with yoga started when I graduated from undergrad in 2015. Growing up and living in Los Angeles, I always knew about yoga but had never tried it. Like many, I enrolled in a yoga class with the intentions of becoming more fit. Fast forward 3 years later and I not only practice yoga 5-6 times a week for my own physical and mental healthy but I have also received my yoga teacher training certification with the intentions of using it within my occupational therapy practice. Not only has yoga transformed my physical health but my entire way of living. Through yoga I have cultivated an overall healthier lifestyle. Specifically, yoga has positively impacted my sleep, stress, eating, and exercise habits and routines. As occupational therapists we understand that not every activity is going to reap the same benefits for every individual. We all have different preferences. With this in mind I plan on helping individuals who are interested in yoga, use it as a tool to meet their health goals. One of the many things that I love about yoga is that there are so many variations. There is hot yoga, power yoga (vigorous), kundalini (psycho-emotional focus), chair yoga, aerial yoga and the list can go on and on. Even within the yoga practice, it is not only about postures but also about strengthening one’s breath work, meditation, concentration, and so on. With the huge variations in types and focus of yoga comes the wide range of ability to grade yoga to match the client’s needs and desires. As an OT, grading the activity to find the just right challenge for the individual is crucial for optimizing health. Yoga gives you so many options to be able to successfully meet the client where they are, at any given moment. Yoga can be a community or an individual practice, it can be practiced in the hot or in the cold, rain or shine. Yoga is all about what you make it and what you take from it. It is such a giving practice with many styles and techniques. With the design to keep the mind and body healthy, it is a perfect tool for OTs to use to help their clients reach optimal well-being in a meaningful way.